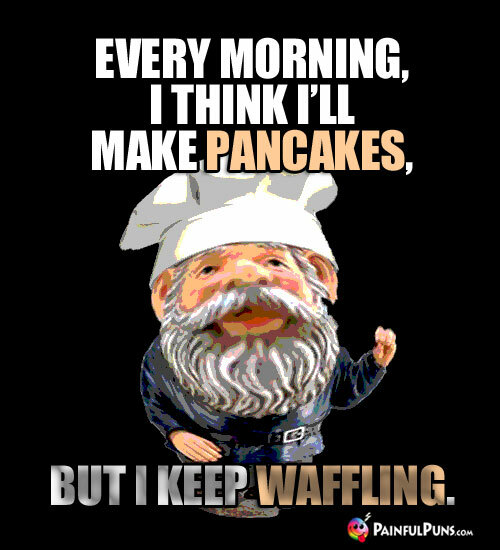 Sample tasty chef jokes, delicious humor, haute cuisine laughs and puns you'll really eat up! Warning: Dig In at Your Own Risk! 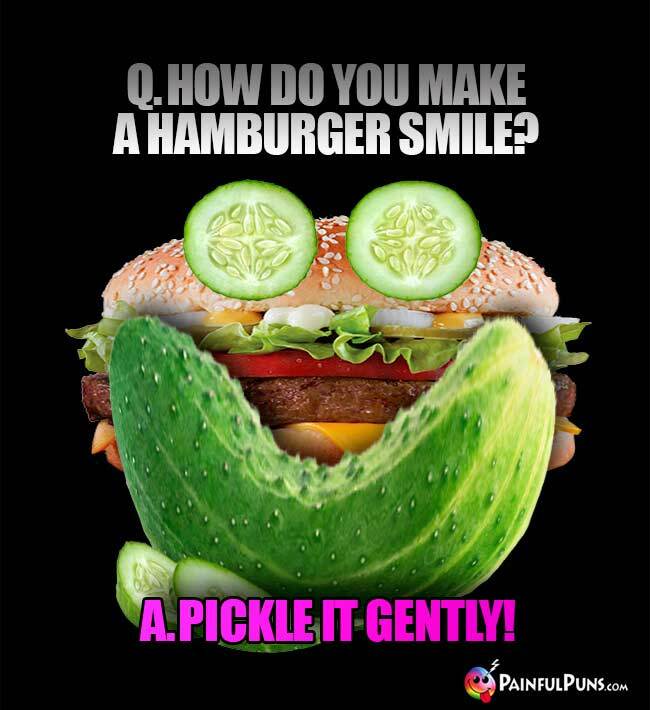 Raw humor, cheesy jokes, and unpalatable puns may be hard to stomach. Q. 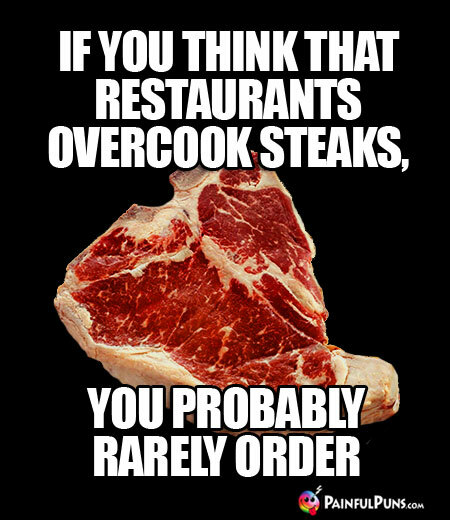 What is the lowest grade of steak? A. Where the rubber meets the road. Seven days without beef makes one weak. 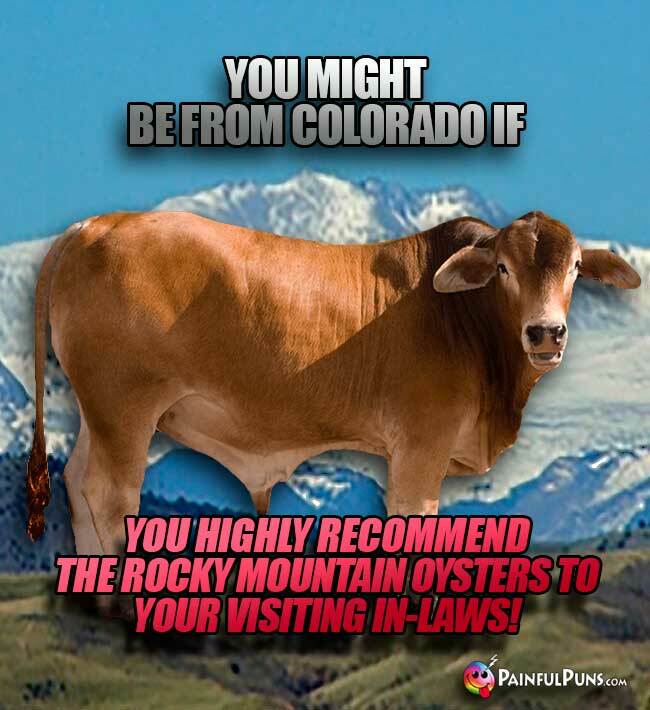 Did you hear about the guy who died eating Rocky Mountain Oysters? The bull must have dragged him a mile! Yes, the bull was really quite testy. Q. What do you call sad coffee? Q. 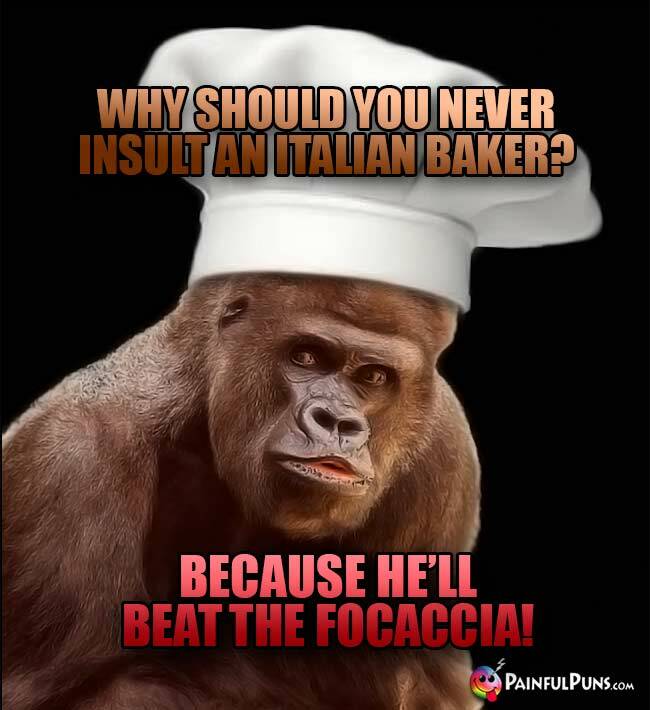 Why are Italians so good at making coffee? A. They know how to espresso themselves. Q. What did the barista's amante say? A. I can't espresso my love for you! Q. 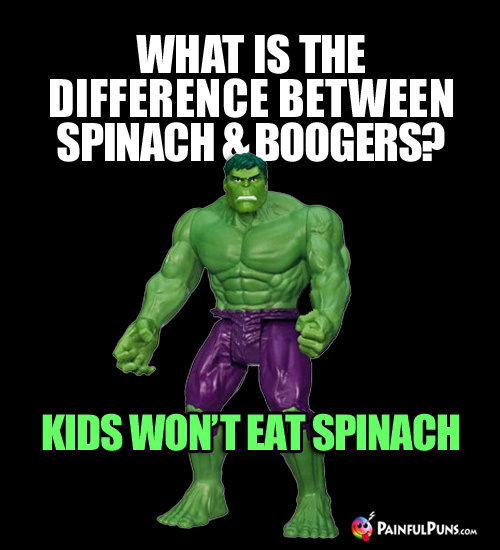 What kind of socks does Hulk wear to plant spinach? Did you know Bruce Lee has a vegetarian brother? His name is Brocco Lee. Q. Which kind of vegetable do librarians like most? Q. How many pastry chefs does it take to make a pie? Q. What is a baker's favorite musical instrument? A. Drums, because they already have the breadsticks. Q. 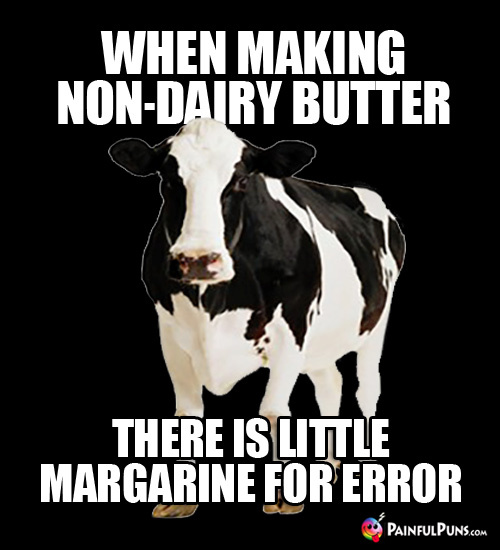 Why did bread break up with margarine? A. For a butter lover. Q. 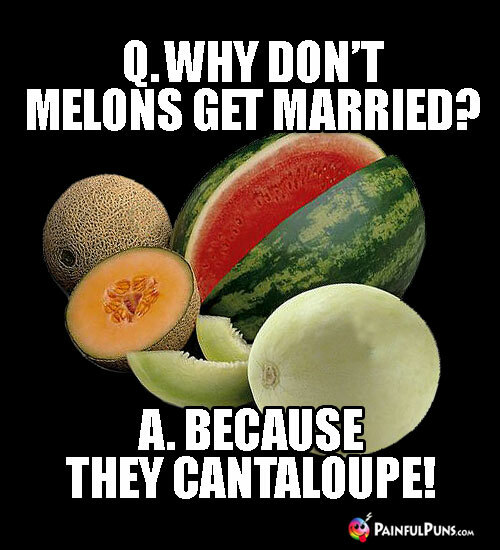 Why did the guy break up with his watermelon vendor girlfriend? A. Because she was always so melon-dramatic about everything! Q. 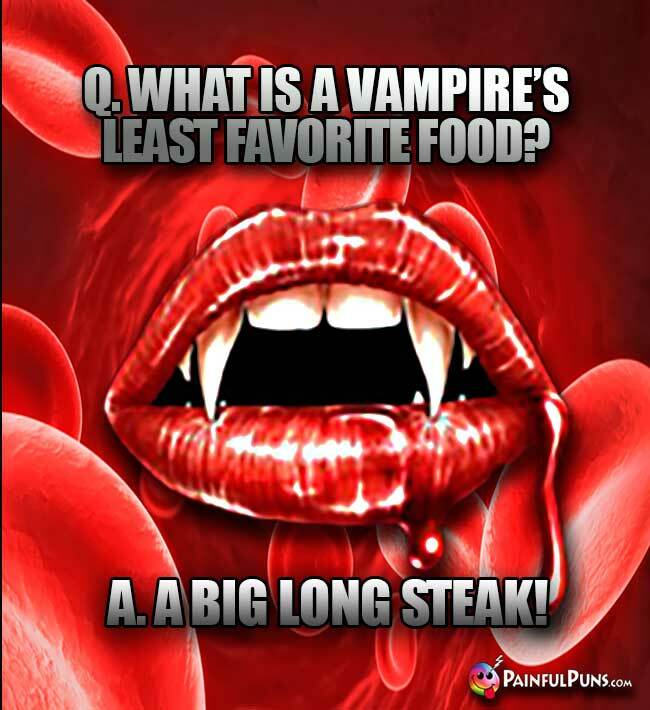 What is a vampire's favorite fruit? Did you know that lemons and limes like to fight? Yes, they're bitter rivals. Q. Where do birds go for their coffee? 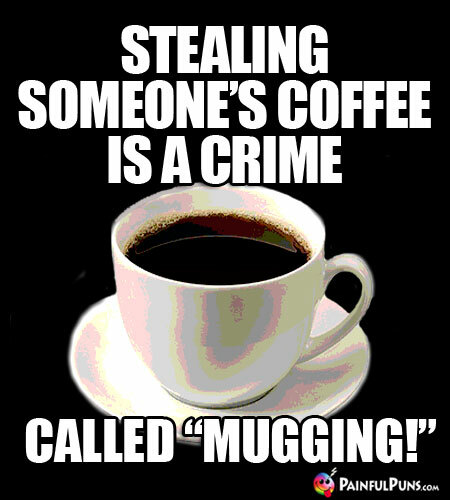 Caffeinated Fact of the Day: If you say "Pumpkin Spice Latte" three times, a girl in yoga pants will appear and tell you all the good things about fall. 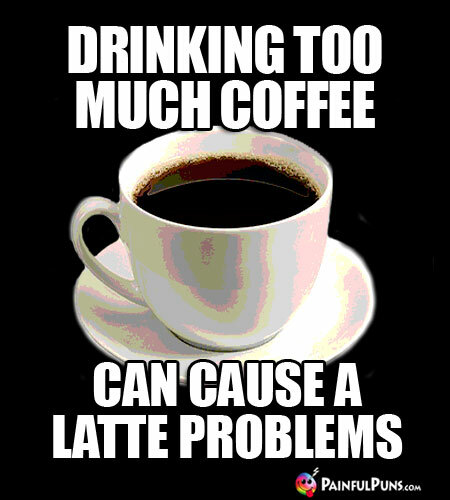 Decaf Fact of the Day: A yawn is just a silent scream for coffee! Q. Why did the chef spill his soup? A. 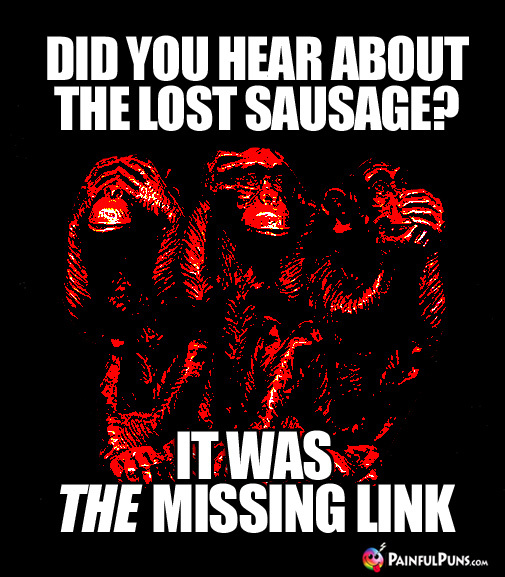 Because there was a leek in the pot! Q. 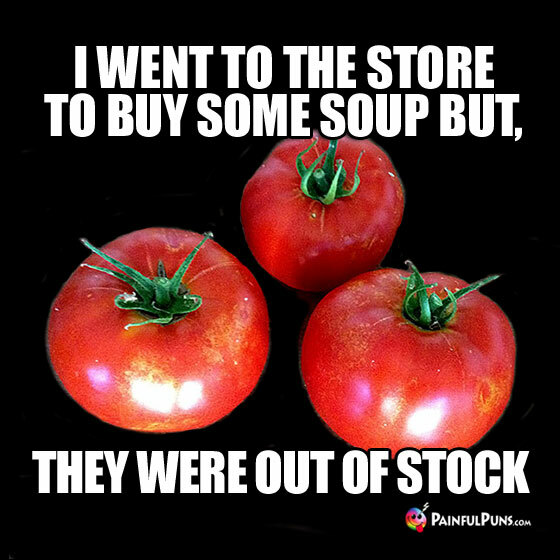 How do you make rich soup? The chef's cooking was so good that even the smoke alarm cheers him on! Q. 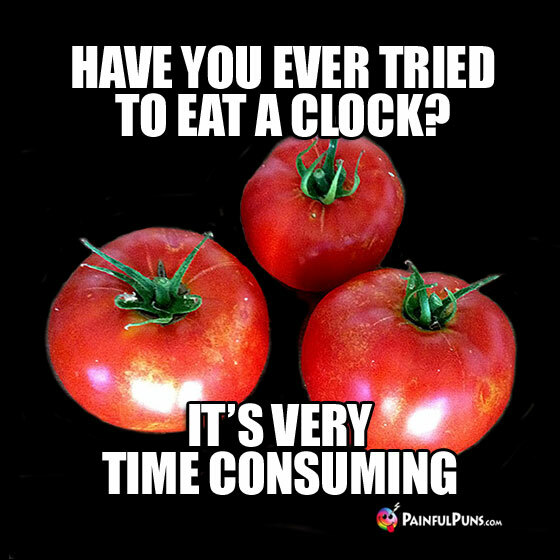 How can you tell if your tomatoes drink alcohol when you're not looking? Q. Why did the guy at the Pepsi factory get fired? A. He tested positive for Coke. Q. Why did the guy quit his job crushing soft drink cans at the aluminum recycling center? A. Because it was just soda pressing. 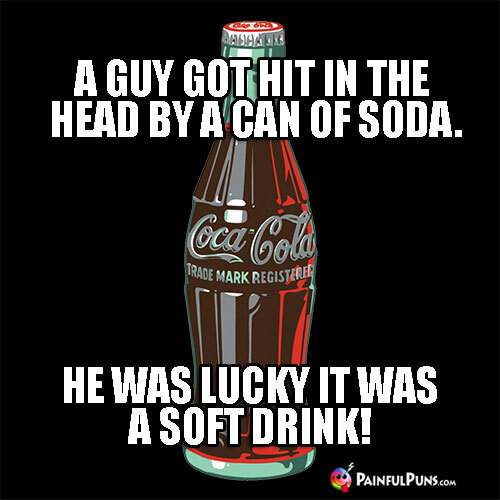 Please pardon these soft drink puns. Yes, we know they're soda dumb. Chef Pick-Up Line: You're twice as sweet as Creme Brulee, and a lot less drippy. Q. What did the audience say to the cheesy comedian? A. 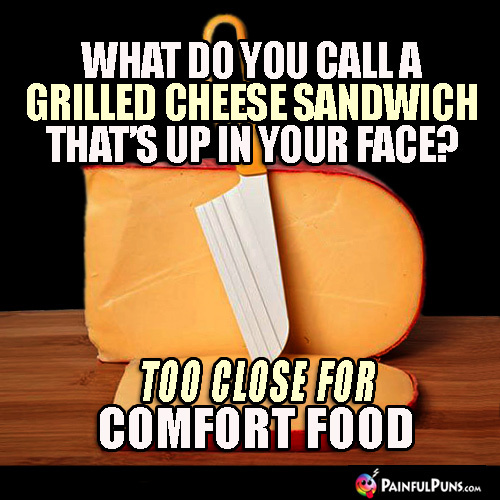 That's a Gouda one! Cheesiest Chef Come-On Ever: If I like you, a cheese sandwich. If I love you, I'll grill it. I would make cheesy chef puns, but that wouldn't be very knife. Cheesy Come-On: Hey girl, are you American cheese? 'Cause I just want to peel you. Whoa, did investigators finally meat their match? Q. What does a man consider a seven-course meal? A. A six-pack in one hand and a hot dog in the other. Q. What does a hot dog go camping in? If I told you a rumor about better butter, would you spread it? Q. What job best suits a cow? A. Baker, because they make cow pies all the time. Butter Pick-Up Line: Hey Girl, you're as steamy as butter on a hot baked potato. Q. What happened to that lost beef shipment? Q. 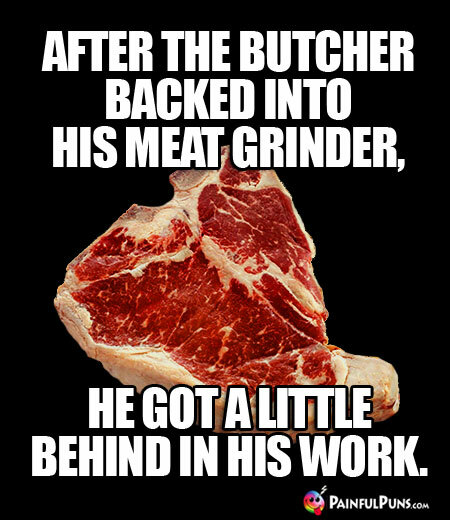 What is a beef lover's favorite song lyric? A. "Is it meat you're looking for?" Q. What is a steer's least favorite Elvis Presley song? ©2017-2019 Painfulpuns.com All rights reserved.